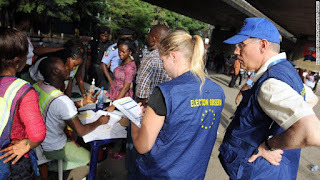 European Union observers take notes as officials of Independent National Electoral Commission (INEC) count ballots during gubernatorial and local assembly elections in Lagos on April 11, 2015. LAGOS, NIGERIA (CNN)--Those who take part in election violence and rigging in the upcoming Nigerian elections will be denied visas, the United Kingdom and the United States have said in a joint statement. The UK government said its observers would monitor polling stations and social media during the February 16 vote and those found inciting violence may also face prosecution. "We would like to remind all Nigerians that where the UK is aware of such attempts, this may have consequences for individuals. These could include their eligibility to travel to the UK, their ability to access UK based funds or lead to prosecution under international law," the government said in the statement released on Thursday. Travel restrictions may also extend to family members, the US government said, adding that the peaceful conduct of the 2019 elections was not only crucial to Nigeria but also the continent. "We, and other democratic nations will be paying close attention to actions of individuals who interfere in the democratic process or instigate violence against the civilian population before, during, or after the elections," the US government said in the statement. "We will not hesitate to consider consequences - including visa restrictions - for those found to be responsible for election-related violence or undermining the democratic process." The two countries said they remained committed to Nigeria's democracy, and Nigerians should be allowed to choose their leaders at the polls. Citizens in Africa's most populous nation will vote in a general election next month, and political parties have begun nationwide campaigns to persuade voters. Allegations of vote buying and violence from party members across the board was rife during previous elections. Last September US observers monitored a gubernatorial election in Osun, southwest Nigeria and said they witnessed incidents of voter intimidation and interference in the electoral process. Early this month, at least three people were stabbed, and dozens were injured after fighting broke out at Nigeria's ruling party, All Progressive Alliance campaign rally in Lagos sparking fears of further violence in the upcoming elections. Political party leaders and presidential candidates signed a peace agreement in December pledging their support for transparency in the electoral process.